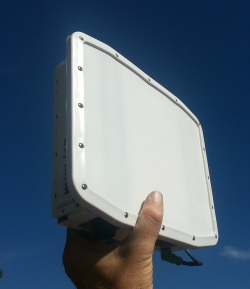 SpotterRF provide the world’s smallest Surveillance Radars. In fact, they are the leader in a new type of radar technology called compact surveillance radar or CSR. Extensive R & D has been undertaken to develop a truly lightweight man portable surveillance solution which can be setup in minutes. SpotterRF CSR sensors are available in various detection ranges, to provide wide area coverage and the ability to automatically slew-cue cameras in a sub 2.5 kg package. By providing a wide-area, all-weather sensing capability, SpotterRF enhances your perimeter security by providing effective site coverage from 4 acres (approx 2 football fields) up to 140 acres (approx 68 football fields), making the SpotterRF one of the most cost effective wide-area surveillance packages available. The Spotter C20 provides 360° coverage at a lower cost than any comparable radar on the market. SpotterRF designed the C20 in response to customer and integrator requests to reduce the difficulty of monitoring remote sites such as wells in the petroleum industry. With their 120° beamwidth, three C20s provide 360° coverage out to 120-meters at a much lower price than a single rotating radar. Without the moving parts of its competitors, the C20 is both more durable and more adaptable to varying terrains, cutting the cost of system maintenance and increasing effective coverage. 120° field of view out to 100m at ±60°. One C40 can cover as much area as 20 fixed thermal Cameras. Extremely hard to defeat it works through rain, fog, snow and tracks any moving target in its line of sight with ranges of up to 350 m with a coverage area of 40,000 square meters. A C40 weighs less than 1.5lbs making it easy to place anywhere on existing structures, poles, fences, trees, etc. Easily connects to existing Ethernet networks with Power over Ethernet switches. Perfect for oil wells, petrochemical plants, utility substations, power plants, cell phone towers, mines. Size 6.9" X 9" X 1.7"
Size 8.7" X 10" X 2.6"